9/23/2008Share this story on Facebook! The Third Annual Tutelo Homecoming Festival was sponsored in part by the City of Ithaca's Multicultural Resource Center. The center's mission is "to provide information, contacts, support, workshops, trainings, books, tapes, and celebrations around diversity issues to the individuals of Tompkins County. The Multicultural Center provides these services in order to facilitate the community's work on diversity issues, to empower individuals around these issues, and to celebrate diversity." Students of anthropology and Native American studies at Ithaca College also worked to make the festival happen. Additional festival sponsors included Ithaca College, Cornell University, the American Indian Program at Cornell, and Wells College. The festival was hosted by the Town of Ithaca and made possible with funding from a Tompkins County Celebrations grant and the Community Arts Partnership. The third annual Tutelo Homecoming Festival recently welcomed back the Cayuga, Tutelo, and Kindred Indian Nations, and the Saponi tribes to Ithaca. 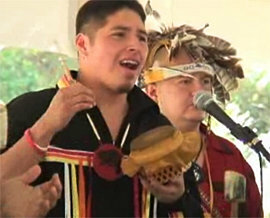 Held in Tutelo Park in the Town of Ithaca, the festival was full of people mingling among stalls offering crafts for sale from many different Native American nations. The festival also featured interactive performances and demonstrations, teachings about Great Law, cornhusk doll making, storytelling, and medicine plant walks. Ithaca College, Cornell University, and other organizations had booths advertising volunteer opportunities, environmental information, and tribe activity participation. A large tent held some of the most popular parts of the festival, including traditional flute music, and a storyteller, who entertained the audience with stories about animals, the creation of man, the peace tree, and lacrosse -- a sport invented by the Native American tribes living around the St. Lawrence River in New York and Ontario, and spread by the Huron and the Iroquois. A big audience favorite was the dancing. The Haudenosaunee Singers and Dancers performed a smoke dance, a couples dance, a women's dance, and dances based on animals such as trout and alligators. Throughout, the audience was encouraged to partcipate as best as they could. The whole fesitval was a wonderful event that gave the Ithaca community a lesson in Native American history and culture.